It’s that time of year again where people see a lot of green stuff and guides for a good St. Patrick’s Day are being released by bars, breweries and newsfolk alike. So I thought I’d throw my hat in to the ring and give you my own St. Patrick’s Day Survival Guide. Stock up on supplies. – It’s only for a weekend, but still. Buy enough food and good beers to last you for that time because you won’t be leaving. Give a last final embrace to any friends and family you cherish, just in case. Board up your windows and lock your doors. – If you don’t, you may find that a keg of crap beer you didn’t buy will be in your house surrounded by shattered glass and you’ll be overrun with university and college students screaming and breaking things and singing Danny Boy even though they aren’t sad because IRELAND. Arm yourself. – A baseball bat is best. I have a battle axe. Better to have it and not need it than need it and not have it. Pray or alternatively recite the Litany Against Fear – It’ll all be over soon. Don’t worry. You must not fear. Fear is the mind-killer. Fear is the little-death that brings total obliteration. DON’T OPEN THE DOOR. – Ignore the other people who aren’t being Irish for a day trying to get in to your place for safety. You open the door, you put yourself and others in your home at risk. They should have prepared. Like you. Drink a beer because you want to, not because you have to. Really, folks. 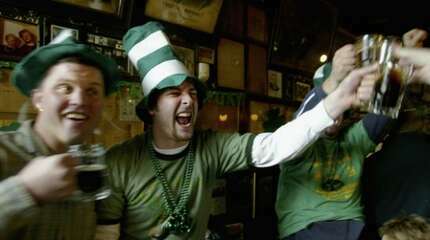 Nowhere does it say that you have to drink until you vomit on St. Patrick’s Day. If you feel like having a drink, do so. If not, then don’t. That’s all from me. Stay safe out there, folks. My wife and i got fulfilled Peter managed to round up his inquiry from the ideas he made when using the blog. It’s not at all simplistic just to always be giving freely procedures a number of people could have been selling. We really realize we have the writer to appreciate for this. The explanations you made, the easy website menu, the friendships your site make it easier to promote – it’s mostly overwhelming, and it is making our son in addition to our family understand the subject matter is fun, and that’s particularly essential. Thank you for all!